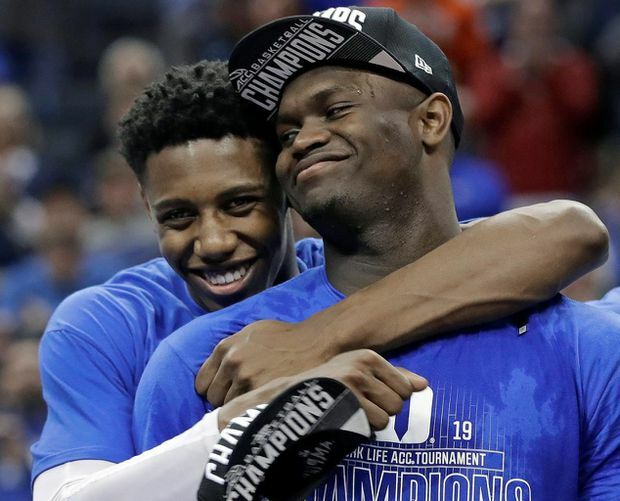 Duke's RJ Barrett, left, hugs Zion Williamson after Duke defeated Florida State on March 16, 2019. Barrett won the Jerry West Award as the nation’s top shooting guard at the College Basketball Awards on April 12, 2019. Canadian RJ Barrett of Duke has won the Jerry West Award as the nation’s top shooting guard at the College Basketball Awards on Friday. Teammate Zion Williamson of Duke and Sabrina Ionescu of Oregon won the John R. Wooden Awards as the nation’s top men’s and women’s players of the year. Barrett was presented with the trophy Friday night by its namesake West during the nationally televised show in Los Angeles. Barrett beat out Justin Wright-Foreman of Hofstra, Carsen Edwards of Purdue, Jarrett Culver of Texas Tech and Kyle Guy of national champion Virginia..
Williamson insisted he doesn’t know if he’s going to declare for the NBA draft and leave Duke early. After accepting his award, he rattled off memories from his freshman year. Ionescu of Oregon was a surprise winner of the women’s Wooden Award. She and Williamson shared the spotlight during the fifth annual ceremony at The Novo in downtown Los Angeles. Gustafson had earned several post-seasonhonours, including AP player of the year for leading the nation in scoring for the second straight season.